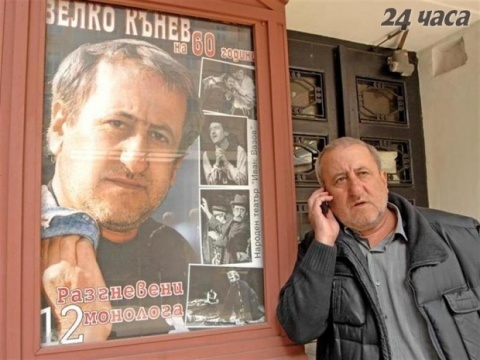 Popular and beloved Bulgarian actor, Velko Kanev, had passed away late Sunday night at the age of 63. Kanev succumbed to vocal cords cancer, which he was battling since 2009. He underwent several treatments in a clinic in Germany after the Chair of the Union of Bulgarian Actors, Hristo Mutafchiev, issued an appeal for donations. The Mayor of Sofia, Yordanka Fandakova, further assisted for BGN 80 000 to be granted from the State Fund for the Treatment of Bulgarians Abroad. Relatives are quoted saying the great actor felt embarrassed to ask and collect money for another round of treatment. Velko Kanev was born on July 31, 1948, in the southern town of Elhovo. His love for acting began in high school. He graduated from the National Academy for Film and Theater in Sofia in 1973 in the class of legendary actor Apostol Karamitev. Upon graduation he received a coveted for many spot in the National "Ivan Vazov" Theater, but decided to choose another path. He worked for three years in the theater in the southern city of Sliven, before moving to Sofia, to work for another three years for the so-called Satire Theater. He became a member of the troupe of the National Theater in 1979, where he performed a number of emblematic roles. But it was cinema that made Kanev a true celebrity and a beloved actor for generations of Bulgarians. One of these movies – "Orchestra without a Name," has been voted in spectators rankings as an all-time favorite among Bulgarian films. In 1981, after the huge success of the movie, with three other actors, who participated in it, Kanev founded the pop band NLO (UFO), which also became hugely popular, and turned into a top TV show. In 2008, Kanev celebrated his 60th anniversary on the stage of the National Theater with the solo play "12 Angry Monologues." He planned to work on a sequel of "Orchestra without a Name" which was set to reunite the characters 30 years later.